At least 17 persons were killed after five suspected female suicide bombers attacked Kofa Community near Dalori in Borno. Eyewitness told newsmen in Kofa that the incident occurred around 8:30pm Sunday, when Muslim faithful were performing their night prayers. “As we were preparing to rescue the victims of the first blast, we heard another explosion close by. “It was really terrifying; many people died and many others were injured. “The third explosion occurred after a short while. “Eventually, we evacuated eight bodies in the night, to the hospital, while 25 others were injured,” recounted Malam Ibrahim Kolo, member of a vigilante group. Mr Victor Isuku, spokesman of Borno Police Command, confirmed the incident, saying 17 persons were killed during the attacks. 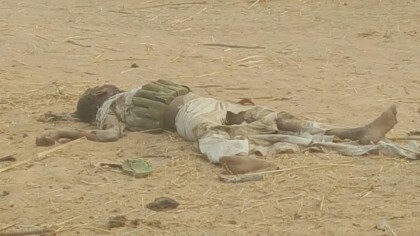 “On Sunday , at about 2030hrs, five suspected female suicide bombers detonated explosives strapped to their bodies in Kofa community, which is about 8km from Maiduguri, and situated along Maiduguri to Konduga road. “The first suicide bomber detonated near a mosque, killing seven persons. ” The second detonated in a house killing five persons, while two other suicide bombers detonated within the same vicinity, killing themselves only”. “A total of 17 persons, including the five suicide bombers died, while 11 persons sustained injuries and were rushed to University of Maiduguri Teaching Hospital. “Police anti explosive team were mobilized to the scene and normalcy has since been restored,” he said. However, spokesperson of the North East Zonal office of the National Emergency Management Agency (NEMA), Abdulkadir Ibrahim, said in a statement in Maiduguri that 16 people were killed. “At about 8.45 pm, two female suicide bombers were intercepted when they tried to gain access into Dalori 2 IDP camp. “Two other female suicide bombers also detonated their explosives at the adjoining Dalori kofa village at about 8.10 pm, where they killed 16 people,” Ibrahim said.